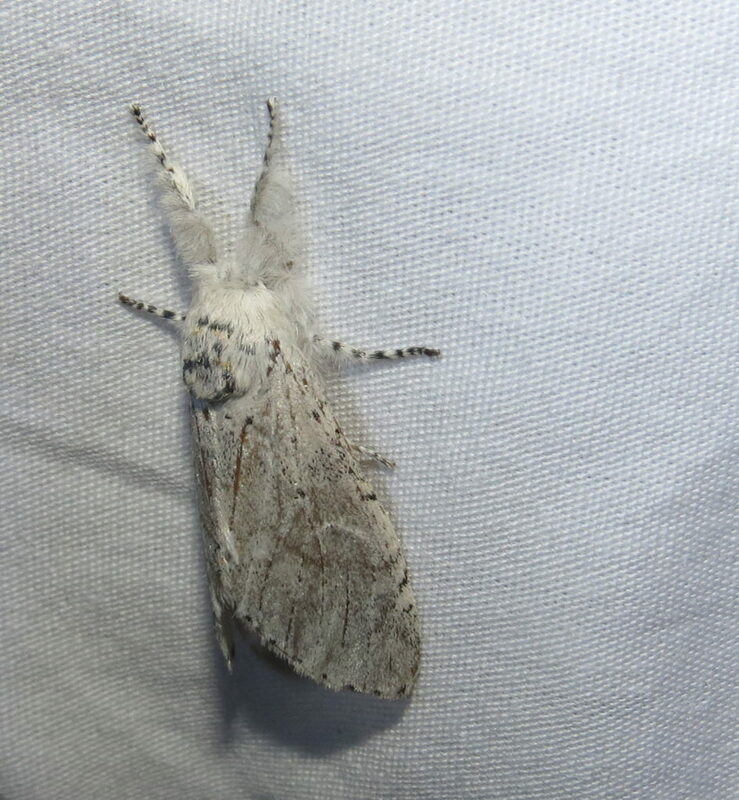 National Moth Week is the brainchild of David Moskowitz and Liti Haramaty who have been holding public “moth night” events on behalf of the Friends of the East Brunswick (New Jersey) Environmental Commission since 2005. The programs became quite popular, drawing thirty to fifty people, and countless moths, to each gathering. Moskowitz and Haramaty also witnessed growth in popularity of their “Moth and Moth-watching” Facebook page, so decided to raise the bar in 2011, planning a national week devoted to nightshift Lepidoptera. Today, the idea has caught fire all over the world, with events in Mexico, Europe, India, and elsewhere. 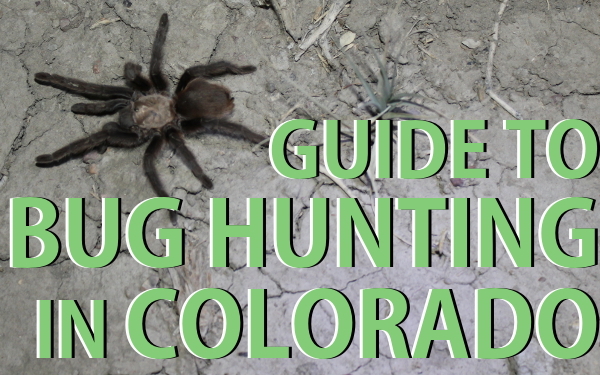 All events, public or private, are designed to collect data to improve our understanding of the distribution of moth species and assess the population levels of vulnerable species. 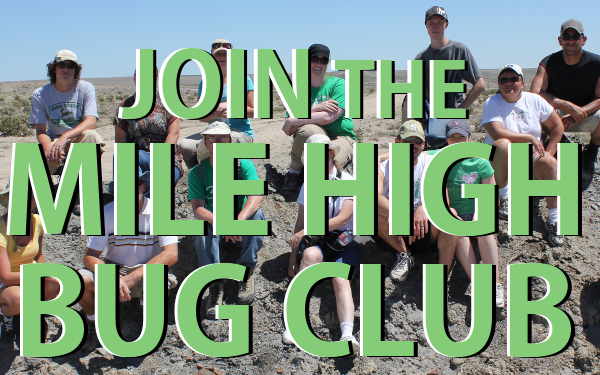 MHBC has been participating for the last three years, with stellar results, both in new scientific records, and in recruitment of new moth appreciators among the public. The turnout at Chico Basin Ranch was surprisingly good given iffy weather and the rather remote location. We even had a professional photographer from Denver. Four light stations were erected near a grove of cottonwoods with a nearby wetland, all within heavily grazed shortgrass prairie habitat. The chief obstacles to negotiating between stations were cow patties and the odd fallen branch. Many thanks should go to Bell Mead, Tim Leppek, and Tim and Zach Vogel for furnishing the blacklights, white lights, and sheets that go into your average night of moth observation. Batteries and/or generators are also standard for locations like this one where there are no outlets to plug into. Our club set-ups vary from “McGuyvered” to highly sophisticated. Every night you make an effort to attract moths and other insects is different from the last. Weather is not the only influence. The lunar cycle has much to do with it, with new moon (no moon) usually being the best circumstance. Warm, humid nights appear to help, too, so a storm earlier in evening can be a good thing. Moths tend to be seasonal, so you will get different species at different times of the year. Even here along the Colorado Front Range, moths can appear at lights almost any time of year, between hard freezes. What did we find on July twenty-second? Plenty. 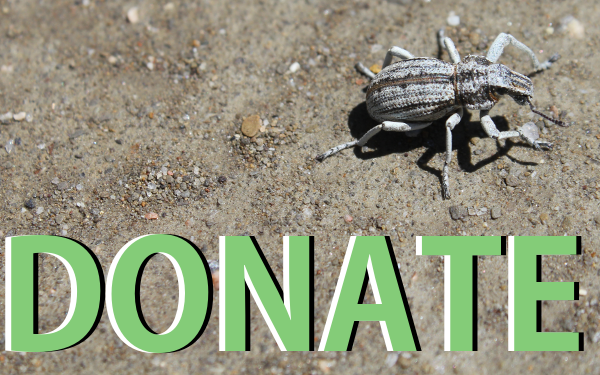 We were overwhelmed by beetles, at least initially. 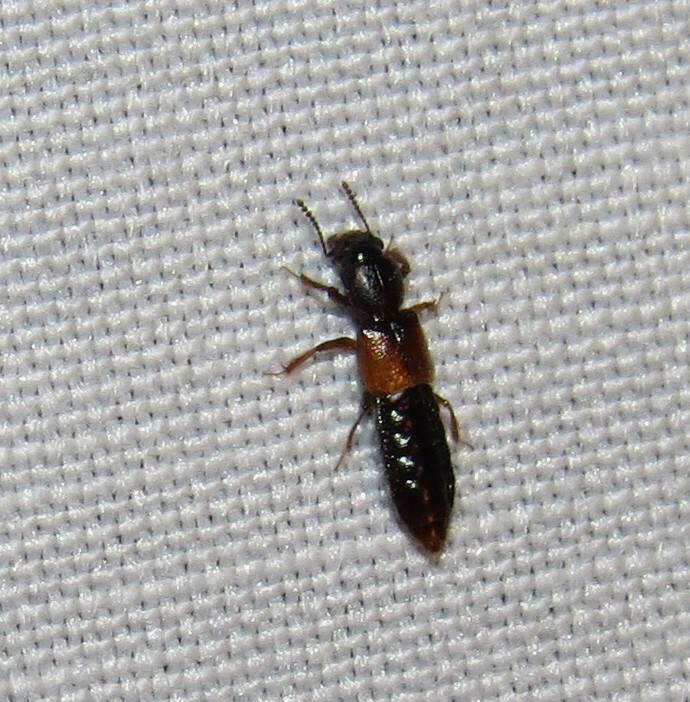 Very small rove beetles (family Staphylinidae), and variegated mud-loving beetles (Heteroceridae) flew in first. 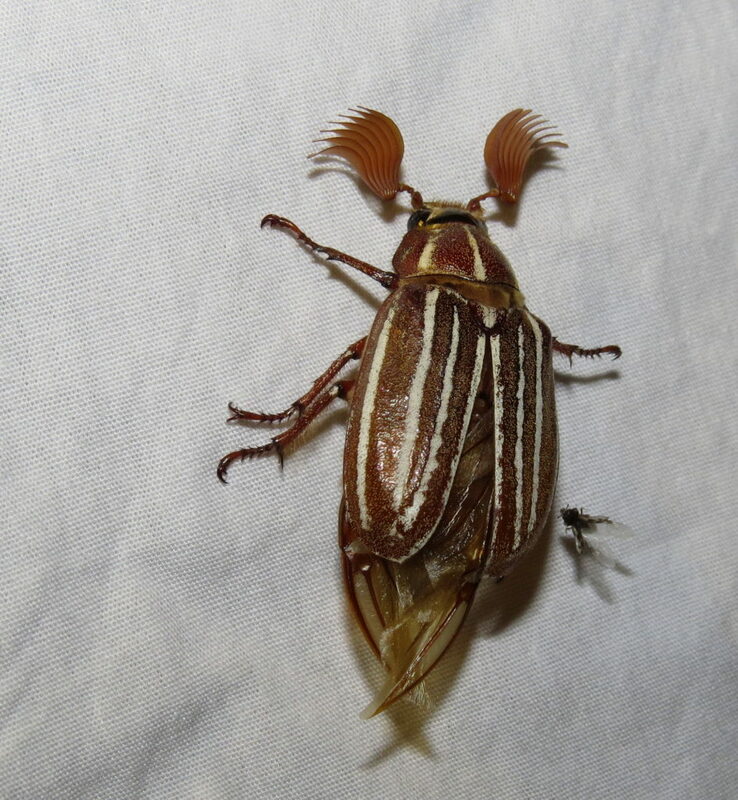 So did several kinds of scarab beetles, from tiny dung beetles to a monstrous Ten-lined June Beetle, Polyphylla decemlineata. Eventually, moths appeared. Some of the most attractive and diverse were very small. 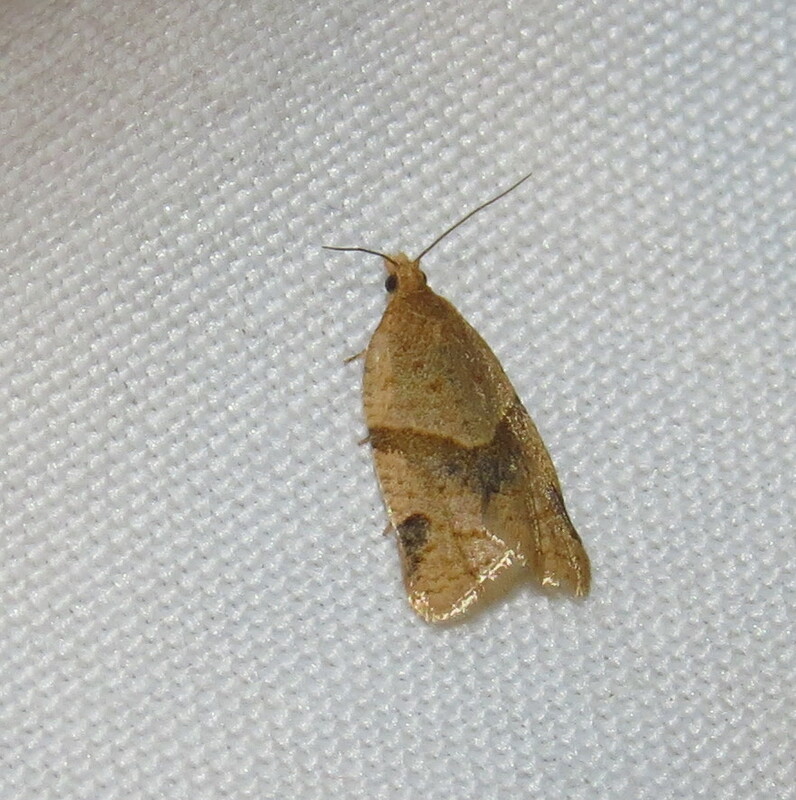 Take the Garden Tortrix, Clepsis peritana, for example. It is a member of the leafroller moth family Tortricidae. The caterpillar stage is the one that rolls leaves to conceal itself from potential predators and parasites. A good number of moths simply defy identification, but that takes nothing away from their beauty. 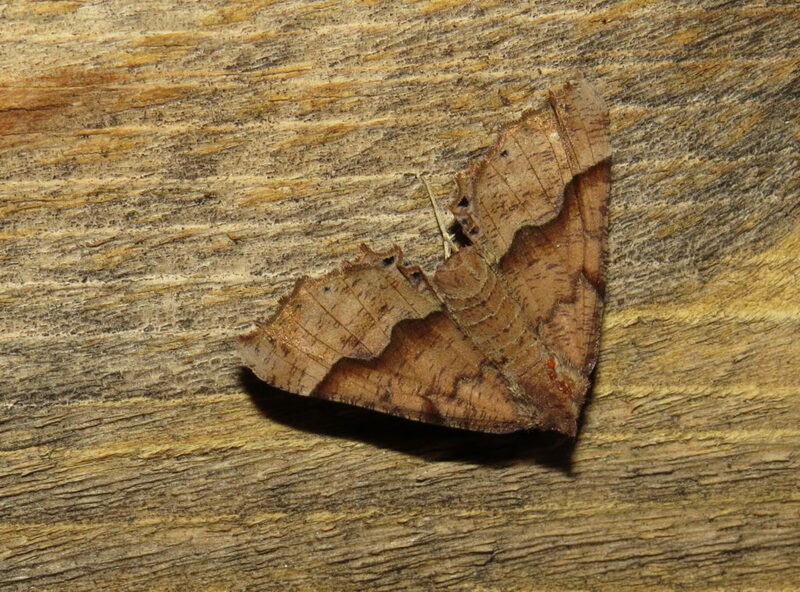 We’re pretty sure this is another tortricid moth, in the genus Hystrichophora, but who knows? Some moths have shaggy legs, like this Gray Furcula, Furcula cinerea. Most moths are designed with camouflage in mind, so away from their usual perches on tree trunks or amid grasses, they are easily seen and their subtle beauty recognized. 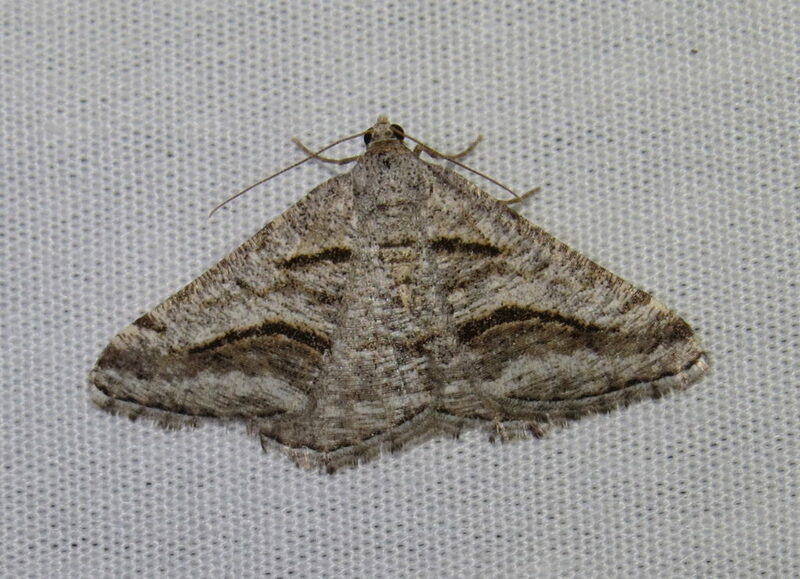 This geometer moth in the genus Digrammia is a great example. 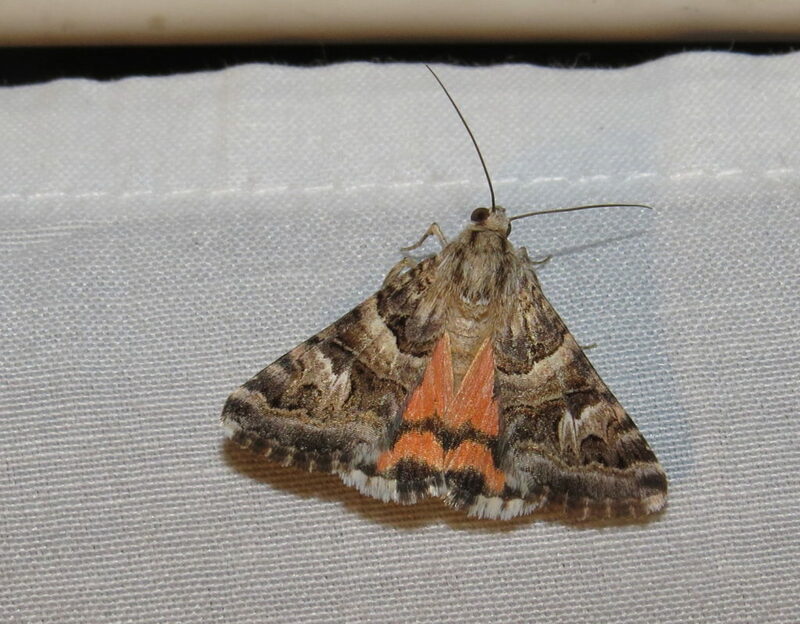 So is this Pero sp., also a type of geometer moth. The tiny red speck near its “shoulders” is a parasitic mite. 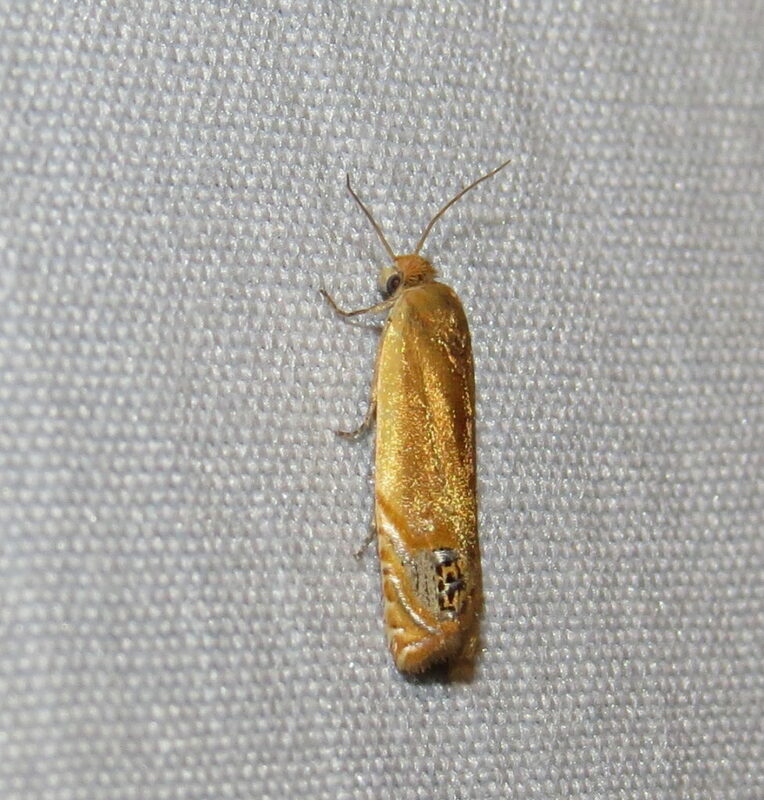 We have noticed that many moths are carrying a heavier load of mites this year, and wonder what the reason is. The mites feed on the blood (hemolymph) of the moth, much like ticks on a dog. Some moths use a startle defense tactic to complement their camouflage. They have brightly-colored hind wings, normally concealed at rest, which they flash to startle an enemy before they take flight. 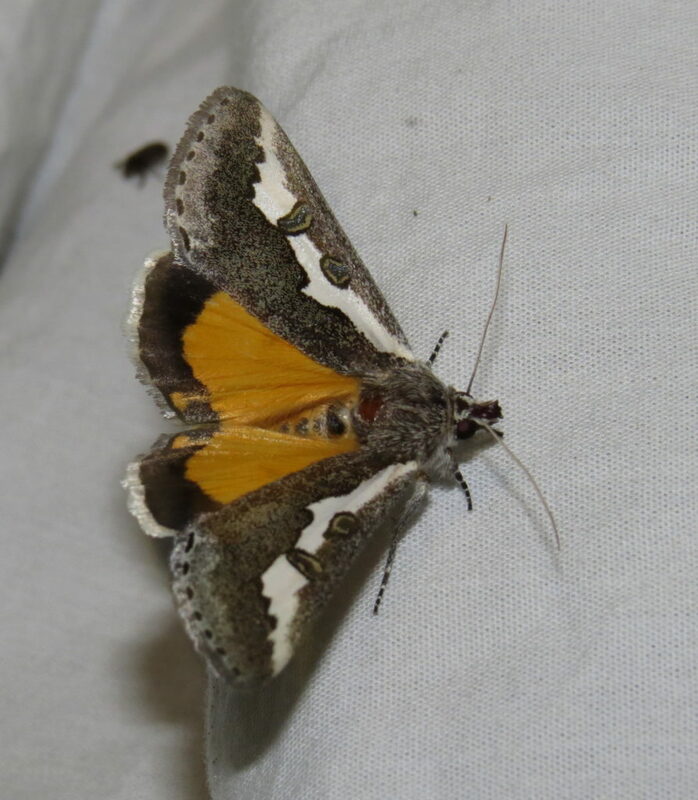 The Purslane Moth, Euscirrhopterus gloveri, a kind of owlet moth, is one example. Another is Drasteria mirifica. We look forward to our next National Moth Week events, and to hearing from you, too. Even if you simply turn on your porch light after dark, you will open a whole new world of amazing moths and other insects. Enjoy.